admin, Author at miningchutes.com , 2014, Clayton Equipment has nominated Variant to be the exclusive supplier, service provider, and North American manufacturer for their premiere line of electric and diesel mine locomotives for the Canadian and US mining industry. Clayton Equipment Ltd is a leading manufacturer of rail haulage solutions, predominantly focused on battery, trolley and diesel locomotives for mining and tunneling applications. Throughout the world you will find Clayton equipment operating in the most arduous conditions. Whether it is hauling on the surface or deep below ground, Clayton machines move equipment, materials, personnel and ore in over 60 countries. Clayton has manufactured over 5000 locomotives in their 80 plus year history, remaining at the forefront of the industry by setting the standard in innovation, safety, reliability and longevity. Combined with Variant Mining Technologies’ existing line of VMT rail and truck loading chutes, trough conveyors, vibratory feeders and other custom material handling machinery, Variant and Clayton are capable of providing hard rock and soft rock mines with complete ore handling and rail haulage systems. For more information on Variant Mining Technologies and Clayton Equipment, please visit their respective website. www.variantmining.com www.claytonequipment.co.ukOur #1 priority is to engineer products that withstand the rigors of working in a heavy industrial environment. We believe in providing a high quality product that goes beyond engineering. Our dedicated team will demonstrate our commitment to you by affording you ongoing support and proper training after your product has been commissioned. We know that downtime costs you time and more importantly money. Variant Mining Technologies is committed to ensuring that our products are operating at full capacity 100% of the time. If you experience an issue with any of our products, our support staff will work with you to ensure that the problem is resolved as soon as possible.Variant Mining Technologies is now a proud member of the Greater Sudbury Chamber of Commerce. Variant Mining Technologies is now a proud member of SAMSSA. Our #1 priority is to engineer products that withstand the rigors of working in a heavy industrial environment. We believe in providing a high quality product that goes beyond engineering. Our dedicated team will demonstrate our commitment to you by affording you ongoing support and proper training after your product has been commissioned. We know that downtime costs you time and more importantly money. Variant Mining Technologies is committed to ensuring that our products are operating at full capacity 100% of the time. If you experience an issue with any of our products, our support staff will work with you to ensure that the problem is resolved as soon as possible. 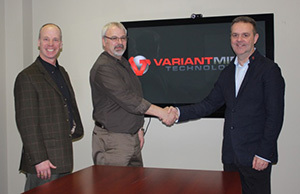 Variant Mining Technologies is now a proud member of the Greater Sudbury Chamber of Commerce.